Advanced Document Systems & Supply offers a wide selection of Automatic Paper Cutters for high performance streamlining of your workflow. Our Heavy duty semi-automatic cutters are feature rich, yet simple to use. Our models include the 4215 16-7/8 inch automatic paper cutter, MBM 4810 18-7/8 inch Automatic Paper Cutter, MBM 4810-EP 18 7/8 inch Paper Cutter, MBM 4850 18 7/8 inch Automatic Paper Cutter, MBM 4850-EP 18 1/2 inch Automatic Paper Cutter, MBM 6550-EP 25 1/2 inch Digital Automatic Paper Cutter, MBM 5551-06 EP 21 1/2 inch Hydraulic Automatic Paper Cutter, and the MBM 721-06 LT 28 inch Hydraulic Automatic Programmable. 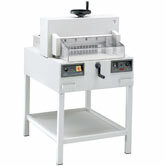 Whether you need a feature rich programmable paper cutter or a safe and accurate high speed cutter, ADSS.net can help. 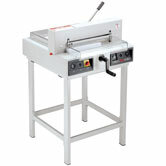 Follow the product links below to view further details about each of our premier, automatic, & electric paper cutters. If you need help matching an automatic paper cutter to your needs, follow the link below to our Automatic Paper Cutters Comparison Table. 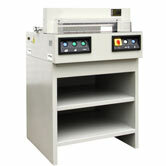 We also offer a large selection of Paper Cutters, Laminating Machines, Coil Binding, GBC Binding and Tape Binding Machines. Consult with our knowledgeable staff if there is a particular machine or product you require. If you have any further questions, don't hesitate to call! 1-800-808-2377. 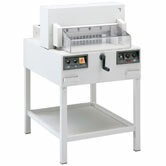 The PH1250A is a sturdy, heavy-duty tabletop cutter with al the features of cutters costing thousands of dollars more. This electric cutter features easy setup with an illuminated cut line and a back guage calibrated in inches and millimeters. 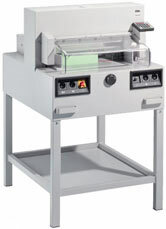 The MBM Triumph 4315 Electric Paper Cutter has features for speed, safety and accuracy like the ability to cut a thickness up to 1 1/2" and length up to 16 7/8" of paper and a bright LED optical cutting line. The Safety Cutting System features: transparent safety guard on front and rear table; safety catch (locks blade lever in up position); and many more safety features. This 17.7 inch semi-automatic stack cutter has the power of an electric cutter at the price of a manual. 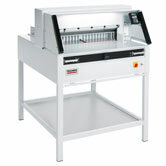 The 4815 Triumph Paper Cutter provides fast, precise cutting for quick printers and in-plant facilities. A high performance cutter for a production environment. 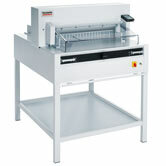 The MBM Triumph 4850 is a heavy duty 18-7/8" fully automatic paper cutter. Feature rich, yet simple to use. 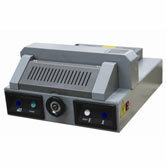 A high performance cutter for a production environment. 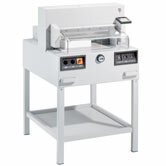 The MBM Triumph 5255 is a heavy duty 18-7/8" fully automatic paper cutter. It performs 9 preset programs with up to 9 steps each. The MBM Triumph 6655 Electric Programmable Cutter is the successor to the popular 6550 EP. It is a fully programmable, highly automated 25.5 inch stack cutter with all of the great features you expect from a high quality stack cutter. Ergonomic, 37 inch working height. Electric blade and clamp drive. Electric back gauge drive with touchpad for easy programming. Front table digital display (cm or inches) with multilingual operator guidance. Digital display accurate to 1/10 mm or 1/100 inch. Stores 99 programs with up to 99 steps in each (up to 15 repeat cuts can be integrated as a single step). Pre-programmed for standard paper sizes.